Porridge is one of my children’s favourite breakfast foods. Both of them enjoy digging their spoons in a big, hearty bowl of porridge each time I make it. I try to rotate breakfasts so that we get a variety of foods every week and not get bored eating the same foods each morning. However, I am sure that my children would be happy to eat porridge every morning for many days in a row if I would make it that often. I never ate porridge growing up, so I had to learn how to make it when I moved to Canada. Initially I made it just for my husband and me. Over the years, my recipe changed, as I had to make it gluten- and dairy-free 3 years ago so that my son can eat it too. Also, I added more protein and fruit to it as I wanted to pack as much nutrition as possible and not just offer my kids a sugary breakfast. It takes less than 30 minutes to make this packed-with-nutrition breakfast porridge. Having a nutritious breakfast that is naturally sweetened and rich in proteins, whole grains, and healthy fats is a great way to start the day. It does not spike the blood sugar so kids stay calm and happy for many hours. A perfect breakfast to eat before they go to school! In a small bowl mix the hemp seeds, the flax seeds, and the walnuts. In a 3-quart pot mash the bananas with a fork or a potato masher. Mix in coconut milk, water, oats, dried fruit (blueberries or cranberries), and cinnamon. Warm everything on the stove (no boiling needed). 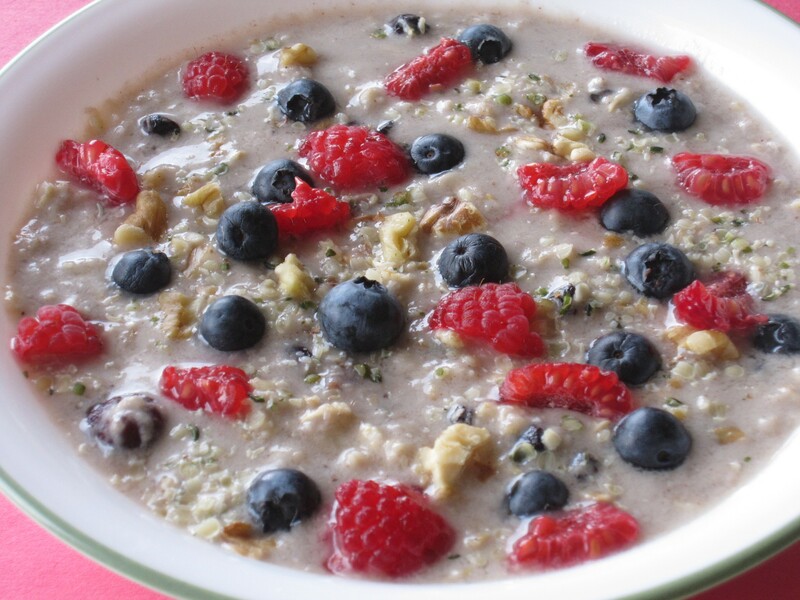 We like our porridge runny, but if you prefer it with less liquid, then add another ¼ cup of oats. Divide the porridge into 4 bowls and top each bowl with a little bit of the walnut mixture. Top everything with blueberries and raspberries. *I break the walnuts into small pieces with my fingers. If you have a small child that can't chew pieces of walnuts, grind them in a food processor. *You don't have blueberries or raspberries? Any berries (blackberries, strawberries, Goji berries) work really well. What are your child’s favourite porridge toppings?